From the ghostly lesson of Charles Dickens’ “A Christmas Carol” at Goodman Theatre (★★★★ through Dec. 29) and the Christmas Eve madness of Will Kern’s “Hellcab” at Profiles Theatre (★★★★ through Feb. 24), we take you on a whirlwind tour of Chicago’s Yuletide fare. It may be a thin strand of tinsel that connects Charles Dickens’ redemptive chestnut “A Christmas Carol” to Will Kern’s bent sprig of an urban Christmas Eve called “Hellcab,” but connected they are, and the one is as beguiling as the other in imaginatively crafted stagings at Goodman Theatre and Profiles Theatre. Taking these two delights as our starting point, Chicago On the Aisle, like the Ghost of Christmas Present, guides you on a fly-over of Yuletide treats on stages around town. Ah, but like Ebenezer Scrooge you say you can’t fly, that you are mortal and liable to fall? Click on my robe. 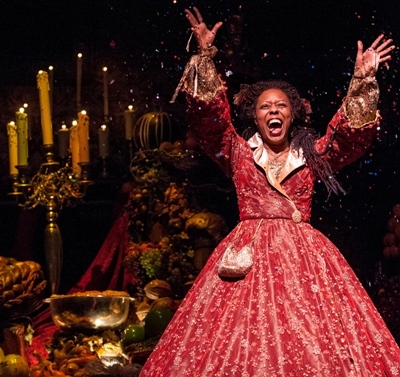 Directed by Steve Scott with unfailing sensitivity of heart as well as eye, Goodman’s 35th annual “Christmas Carol” boasts the spirit, the look – Todd Rosenthal’s sets and Heidi Sue McMath’s costumes seem sprung from Dickens’ pages — and not least the magic this beloved story conjures in the mind. The illuminated, soaring Ghost of Christmas Past (Elizabeth Ledo) and the sparkling Ghost of Christmas Present (Penelope Walker) surely take us all back to other places and remind us of the troubled world at hand – not merely the want, but even more particularly the ignorance. Yet Dickens’ parable does not end with shadows, or even with the great and terrible specter of a closed life unaltered, but rather with reclamation and joy. Indeed, Yando’s redeemed, exuberant Scrooge – with a lot of help from his friends — gets the meaning of unbuttoned joy, if anybody ever possessed the knowledge. Whoosh. We’re seated in Profiles’ wonderfully adaptable new Main Stage space, now occupied almost entirely by a real car – a battered taxi with its roof removed so we can follow the careening conversations (and other goings-on) that take place therein during one Chicago cabbie’s Christmas Eve shift. It’s a motley crew indeed that tumbles and stumbles into and out of this sorry conveyance whose driver (Konstantin Khrustov) serves in the time-honored roles that are a cabbie’s lot: interlocutor, counselor, therapist. And of course – yikes! – witness. This is a 20th anniversary revival of “Hellcab,” which opened at Chicago’s Famous Door Theatre as a late-night show in 1992 and ran for a solid decade. Since then, “Hellcab” has been produced everywhere, usually with half a dozen actors playing all the roles. But profiles has gone all out, trooping 34 actors through fleeting vignettes of hilarity and melancholy, terror and connection. Through it all, Khrustov plays the eyes-forward driver who just wants to get through his shift and earn some money. But sometimes a cabbie can’t help seeing the crazy stuff in his mirror, or hearing the world-weary narrative from the back seat, or feeling the cold sweat on this neck. Or finding good will on a Chicago Christmas Eve. 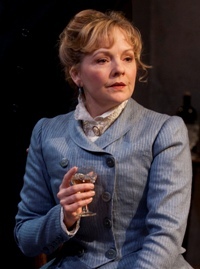 “James Joyce’s ‘The Dead.’” High spirits rule at a gathering of friends and family in this adaptation of Joyce’s famous short story as a play with music, by Richard Nelson and Shaun Davey. But ghosts of past, present and future have crashed the party. Court Theatre, through Dec. 9. Read the review at ChicagoOntheAisle.com. “Charles Dickens Begrudgingly Performs ‘A Christmas Carol.’ Again.” This affectionate play rolls aspects of Dickens’ life – his inspiration and zeal — into his beloved parable on the humanity of Christmas. The Building Stage, through Dec. 25. “Christmas in Chicago.” Mixing behind the scenes “drama” of four ego-driven actors with performances highlighting and skewering 2012’s events, this satirical musical revisits the past year with plenty of backstage hijinks. Co-produced by Chicago Commercial Collective and The Fine Print Theatre, Dec. 13-23. “The Christmas Miracle of Jonathan Toomey.” When a boy loses the treasured wooden nativity set that links him to his dead father, his mother persuades a lonely, ill-tempered woodcarver to create a replacement and to allow her son to watch him work on the new piece. As Christmas approaches, the three struggle to put painful memories behind them. Provision Theater through Dec. 23. “The Christmas Schooner.” The Great Lakes schooner Rouse Simmons was known as “the Christmas tree ship.” Its captain led perilous voyages to transport fir trees from Michigan’s Upper Peninsula to Chicago’s German immigrants during the late 19th century. This tale of love and loss celebrates life while honoring heritage. Mercury Theater though Dec. 30. “Dr. Seuss’ ‘How the Grinch Stole Christmas!’ The Musical.” Max the dog narrates this perennial favorite about the evil Grinch’s scheme to prevent Christmas from coming to Whoville — and how the Grinch learns the real meaning of the season. Cadillac Palace Theatre, through Dec.16. “It’s a Wonderful Life: Live at the Biograph!” This classic comes to life as a live radio show, with sound effects, telegrams, commercial jingles and an original score. Plus cookies for everyone! 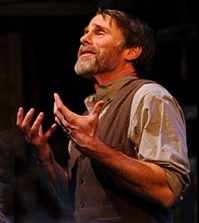 Produced by American Blues Theater at Victory Gardens Theater at the Biograph, through Dec. 30. “It’s A Wonderful Life: The Radio Play.” Yes, there are two companies doing this radio play. Frank Capra’s 1946 film becomes a studio drama read at a period-style radio station. Audiences might be recorded live to be aired on WBEZ Chicago Public Radio. American Theater Co., through Dec. 30. “The Santaland Diaries.” It’s the eighth year for David Sedaris’ rollicking misadventures of a Christmas elf laboring as Santa’s helper at Macy’s in the face of over-driven shoppers and obnoxious kiddies. 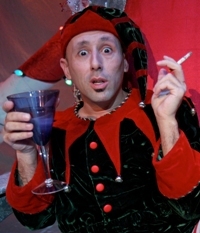 Mitchell Fain stars as Crumpet the naughty elf. Theatre Wit through Dec. 30. “It’s a Wonderful Santa Land Miracle Nut-Cracking Christmas Story… Jews Welcome.” Embark on a seasonal adventure with singing, dancing, stories, interactive games and non-holiday specific eggnog. Spend time with family and friends amidst a flurry of excitement that combines many of the world’s most beloved holiday stories and traditions. Produced by Street Tempo Theatre at Stage 773, through Dec. 3. “The Nutcracker” Ballet. The Joffrey Ballet renews its spectacular production of this all-time Christmas favorite, replete with Tchaikovsky’s music, gorgeous costumes and elaborate sets. Auditorium Theatre, Dec. 7-27. 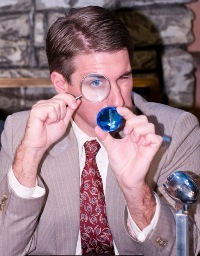 “Sherlock Holmes: The Case of the Christmas Goose.” Adapted from one of the most popular of Arthur Conan Doyle’s Sherlock Holmes stories, “The Adventure of the Blue Carbuncle,” this delightful holiday mystery follows Holmes and Dr. Watson in their search for a gem called the Blue Carbuncle, which has been hidden inside a Christmas goose. Live musical accompaniment, humorous commercials and a Christmas sing-a-long. Raven Theatre, Dec. 14-30. Radio City Christmas Spectacular. A bundle of new precision routines — as well as new costumes and a 50-foot LED video screen that takes audiences to New York’s Times Square and Santa’s workshop — highlight this season’s edition of the Rockettes’ extravaganza. Akoo Theatre at Rosemont, Dec. 14-30. 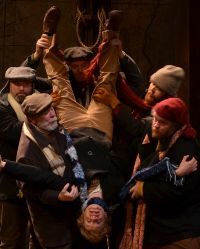 “A Christmas Carol.” Michael Joseph Mitchell stars as the grasping, covetous old sinner Ebenezer Scrooge — redeemed by the spirits of Christmas — in Dury Lane Theatre’s annual production, with traditional carols bundled into the package. Breakfast or dinner with Santa is offered on select performance dates. Drury Lane Theatre, Oakbrook, through Dec. 22. “Plaid Tidings.” It’s the perennial hit show “Forever Plaid” — a vocal quartet killed in a car crash returns to earth for one last performance of music from the ’50s and ’60s — with a Yuletide twist. In the spirit of the season the guys flavor their usual repertoire with Plaid-erized Christmas songs, and a special super-condensed tribute to the Rockettes, the Chipmunks and the Vienna Choir Boys. Theatre at the Center, Munster, Ind., through Dec. 23.